I have been into art and painting most of my life and you never stop needing to learn new areas or keep going back to basic and practice old ones, so at the start of this year I registered on a Udemy course run by Rod Moore (Rod Moore, Complete Colour mixing course for artists). I started the course last week in the evenings and so far its very good, I like very much the structure of the courses run by Udemy as they are perfect for adult study allowing you to use your spare time to gain new skills. 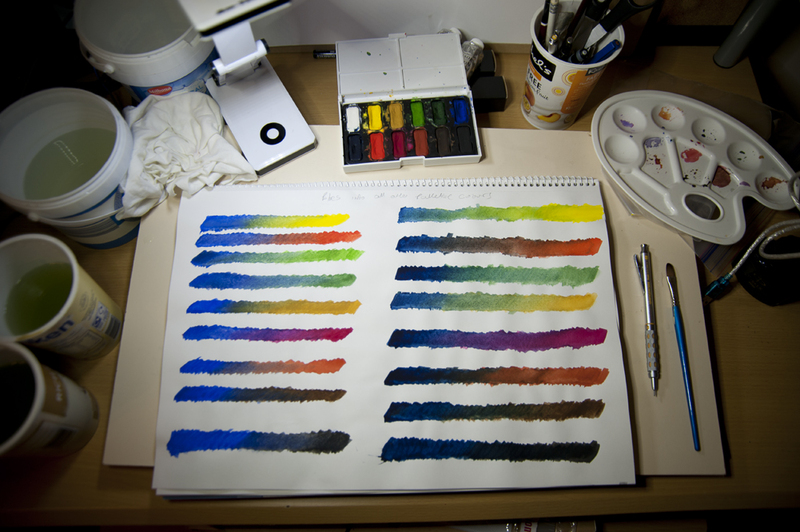 Here are some of the basic colour mixing techniques I have covered so far….. Creating a colour mixing wheel. 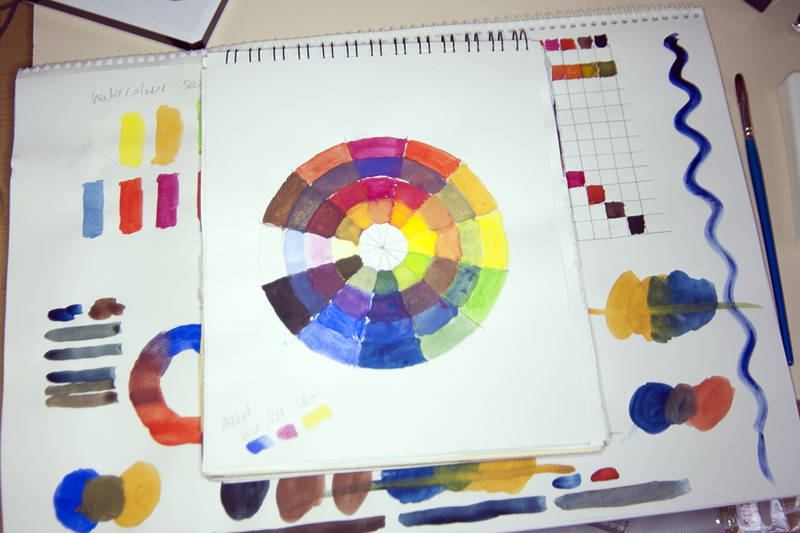 Here the colours provided in my watercolour palette are laid out on the very outside of the wheel, working inwards I have mixed the primary colours of Blue, Red and then Yellow to show the results of mixing primary colours. Mixing Blue, Reds, Yellow and Greens. Most sets of paints contain more than one type of Blue, Red, Yellow and green paints, so in the above images I have worked on taking all the paints in these groups one by one and mixing them with the other paints outside the selected group. The first image for example is using two versions of green, the second two versions of blue – then mixing these with all the other remaining colours. This type of colour mixing produces some very interesting results and helps show just how different the results of mixing different Blues, Reds, Yellows and Greens with other colours can be. 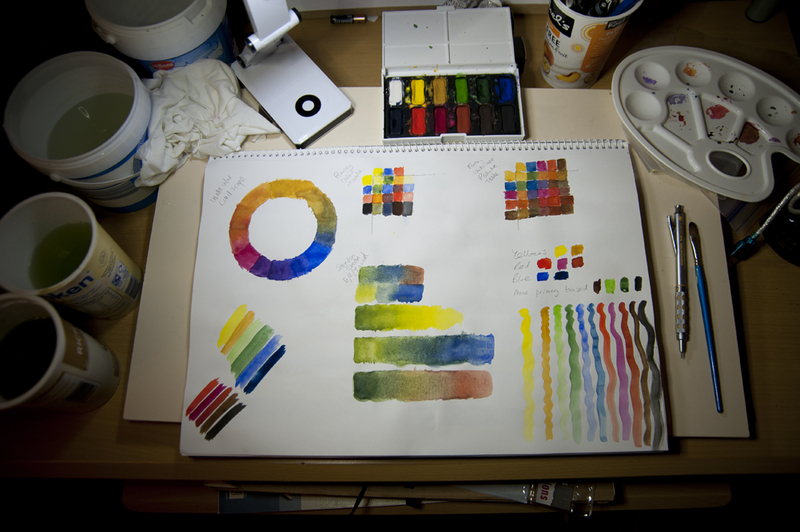 Landscape colour mixing – wheel and chart. As said above different available paints can fall into the basic descriptions of blues or yellows and reds, but are individually very different from each other, in the images above I have painted a colour wheel that uses more earth versions of these primary colours. These versions of the Primary colours (Blue,Red and Yellow) when mixed help to produce results much more likely to be used in Landscape Painting, you can see that they results in a much more earthy looking colour wheel than one produced by more standard primary colours. 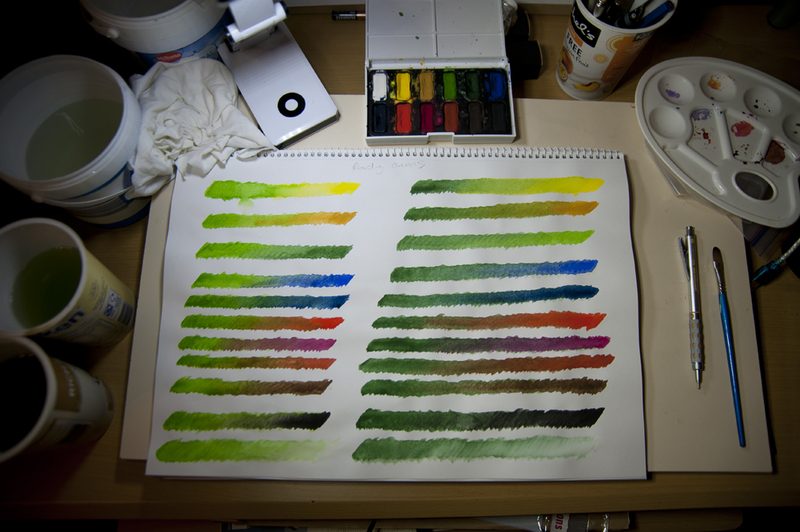 I have also produced a colour chart on the right hand side of this page that shows the same mixing results but in block of colour, the standard mixing chart is in the centre of the page and as you can see this produces a much more vivid set of resulting colours, ones much less suitable for landscape painting. One thing I have noticed while working through these exercises is that watercolour paint does not mix very well compared to Acrylic or Oil paints, which both produce much better stronger results. Its harder to get watercolour to produce many different levels of the mixed colour and for these results to have much depth to them , so my next stage is to repeat all these exercises using artists acrylic paints.